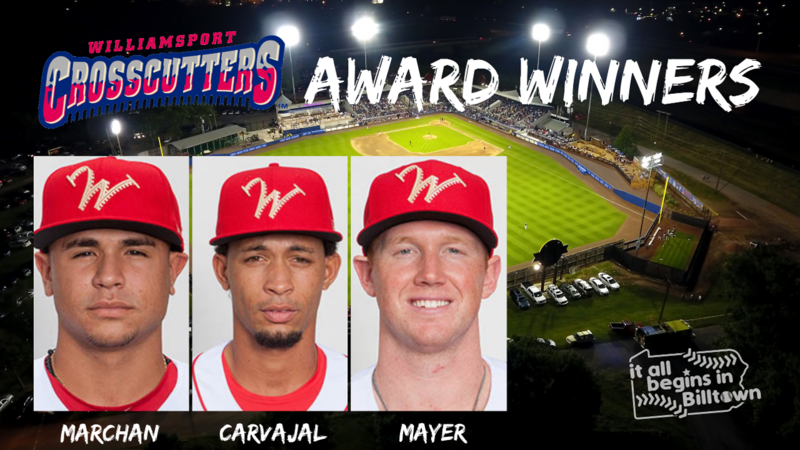 The Williamsport Crosscutters presented their annual end-of-season awards prior to the final game of the 2018 season on September 3 at BB&T Ballpark. In an award voted on by the Cutters players and coaches, C Rafael Marchan was named the 2018 Williamsport Crosscutters Most Valuable Player sponsored by UPMC Susquehanna. Marchan was signed as an international free agent by the Philadelphia Phillies in 2015. He ended the season with a .301 batting average which ranked 4th in the NYPL. He led the Cutters with 9 stolen bases and was one of six Williamsport players picked to play in the league's 2018 All-Star Game. Players who have won the Cutters MVP in past seasons include current and former major leaguers such as; Nyjer Morgan, Steven Pearce, Alex Pressley, Cesar Hernandez, Maikel Franco, and Aaron Altherr. The Rankin Johnson Pitcher of the Year Award, also voted by fellow players and coaches, went to Cutters right-hander Rafael Caravjal who had a 1.59 ERA coming out of the bullpen for Williamsport. The Crosscutters ended the season tied for 5th place in the NYPL Pinckney Division with a record of 32-44.